It has been a season of mixed emotions thus far for Villa fans. The club’s best start in many years was followed by a dismal run of defeats and the longest scoring drought in Premier League history, followed by a run of just one defeat in seven games, most recently leading to a point against Manchester United, our biggest bogey team. This article will look in a little more detail at some of the statistics behind the results that see Villa in 12th position in the Premier League table going into Christmas. The lack of shots and shots on target is just as concerning. Only Hull have created fewer chances this season as Villa and the shots per goal scored shows that Villa are failing to convert the relatively few chances that they are actually creating. Let us look into more detail as to how Villa’s shots are being created and see whether that can explain the poor conversion rate. As some background, this article from Colin Trainor suggests that there is a reasonably strong correlation between speed of attack and conversion rates. The faster the attack from a team, the greater the conversion rate of the shots that are generated from those attacks. Michael Caley has compiled some very useful statistics here that we can use to look into more detail at Villa’s attacking ability. Interestingly, we can see that 25.0% of Villa’s shots this season have come about as a result of a fast attack. While this tallies well with our idea of Villa as an attacking team, it would suggest that the expected conversion rate for Villa this season should be fairly high. Instead, we can see that Villa require more shots on target per goal than any other team. Villa’s 43.4% of shots from the ‘danger zone’, where the greatest chance of scoring comes from, again suggests that Villa should be creating relatively high value chances. This is 3rd highest of all the teams in the Premier League. So, the chances that are being created are from quick counter-attacks and in the most dangerous areas. The fact that these chances are not being converted raises questions about the strikers themselves. The fact that Christian Benteke has played just 625 minutes this season through injury and suspension has not helped matters, but now that he is back and playing well, might we see more of these chances being converted? Interestingly, out of the three most attacking players (Agbonlahor, Weimann and Benteke), it is Christian Benteke that has required the most shots per goal this season. His two goals have come from 19 shots, while Andreas Weimann has required 6.0 shots per goal and Agbonlahor 5.67. Whether this reflects a difference in the type of shots that each player is taking (e.g. Benteke with more headed attempts) or whether it is just taking Benteke a few matches to fully get back up to speed remains to be seen. The other major concern amongst the fans is a lack of creativity in the midfield. The lack of a traditional ‘number ten’ has been flagged up for many years now, but seems not to have been addressed yet. A ‘key pass’ is a pass that leads to a shot on goal. If we look at Villa’s players this season, we can see that there are no players that really stand out as regularly creating chances. Of the regular starters, Ashley Westwood has the most key passes per 90 minutes with 1.06, followed by Charles N’Zogbia (0.85), Andreas Weimann (0.79) and Tom Cleverley (0.79). Joe Cole has been restricted to just 105 minutes this season due to injury, but his 4 key passes during that time (3.43 per 90 minutes) shows that he could have the potential to be the creative player that Villa desperately need, if only he is able to stay fit. One player that has been missed in recent weeks is Fabian Delph. He has shown in the past year or so that he has developed into a very good midfield player. However, the aspect of his play that Villa have most missed in his absence is his ability to beat a man with the ball. His 2.59 successful dribbles per 90 is over double what any other Villa player has achieved this season and it is an important tool in terms of starting attacking moves. By taking it past a player, he is able to drive into space, commit other defenders and free up his teammates. Without him, it has been tough for Villa to create space for their attacking players simply by looking to pass the ball around. While the midfielders may be very similar, they are all very comfortable on the ball. The top four players in terms of passes per 90 are Westwood, Sanchez, Cleverley and Delph, all with completion rates of over 80%. Slightly surprisingly, it is Ashley Westwood that has the lowest completion rate at 80.8%, although this could be due to the fact that he is the midfielder that most looks to play the cutting ball through the opposition defence. Tom Cleverley has been accused at times of playing the simple ball and not looking to create more, and it is Cleverley that has the highest completion rate at 87.3%. Once again, Jores Okore shows up very favourably here. His pass completion rate of 86.4% is second only behind Tom Cleverley and his long ball completion rate is comfortably the highest of all the defenders. We can see that Villa’s 20 goals conceded puts them 8th in terms of the best defences in the Premier League. The five clean sheets also puts them joint sixth overall. However, what is interesting is that Villa are 15th in terms of shots against and shots on target against. They are conceding plenty of shots, but for some reason, they are not conceding many goals. Let us look further at why this may be the case. Using Michael Caley’s statistics from earlier, we can look into where the shots that Aston Villa have conceded have come from. We can see that 34.2% of the shots that Villa have faced have come from slow attacking moves, which should have the lowest conversion rates. This is the highest percentage of any team in the Premier League this season and helps to explain why teams seem to have such a poor conversion rate against Villa. Just 13.3% of shots come from fast attacks, which is the 7th lowest value in the Premier League this season. This is almost certainly a product of Villa’s style of play, which involves plenty of sitting deep and looking to break quickly. Against a team sitting deep and defending, it is tough for opposition teams to generate quick attacks. One slightly worrying statistic though is that 40.0% of the shots that Villa have faced this season have come from inside the ‘danger zone’. This is the 6th highest in the Premier League, although if we combine this with the reasonably high proportion of shots in the danger area that are coming from crosses (52.3% - 2nd highest in the Premier League), it would seem that plenty of opposition chances are coming from headers from crosses being put into the box. If you are to concede chances in the danger area, it is probably preferable that these come from headers, rather than chances with the ball at the feet of an attacker. The 40.9% of shots against from outside the penalty area for Villa this season is 15th in the Premier League. Combining all this information, it would seem that the chances that Villa are conceding this season are coming at the end of a slow passing move from the opposition, either from a cross into the box or from working the ball into a crowded penalty area and trying to get the shot off. This deep defensive tactic leads to plenty of chances being conceded, but not too many of those are clear cut chances for the opposition. Let us now look at which players are most involved in defensive actions. The two obvious defensive actions that are recorded are tackles and interceptions. Both involve taking the ball off of the opposition team and recording a turnover of possession. To begin with, let us combine the two actions in a single statistic – tackles and interceptions per 90 minutes (T&I/90). Matthew Lowton currently leads this for Villa with 5.48, followed by Jores Okore (4.83), Tom Cleverley (4.12), Alan Hutton (4.08) and Carlos Sanchez (3.73). In terms of the other defenders, we have Ciaran Clark (3.32), Aly Cissokho (2.94), Nathan Baker (2.80), Ron Vlaar (2.58) and Philippe Senderos (1.71). For the other midfielders, we have Ashley Westwood (2.71), Fabian Delph (2.24) and Kieron Richardson (1.56). So, if we break this down, can we see differences in how players defend? Looking at the midfield, we can see that both Tom Cleverley (2.85 v 1.27) and Carlos Sanchez (2.16 v 1.57) show more tackles than interceptions, while Ashley Westwood (0.98 v 1.73) is the opposite. This would seem to fit in with the common perception that Westwood is the more intelligent footballers that is able to step in and intercept balls, but who maybe does not get stuck in as much as might be hoped in the middle of the pitch. Tom Cleverley’s 2.85 tackles per 90 is actually the highest of any Villa player this season, which shows a side of his game that might not have been immediately recognised – his ability to win the ball back and get stuck in. Looking at the central defenders, all five of the players that have been used there this season show more interceptions than tackles. This makes sense given that it is a risk for players to go in for tackles when the opposition is closing on the penalty area. In midfield, you can take the risk of stepping in and trying to win the ball back as there are players behind you to cover. In defence, you often do not have that luxury. This also reflects that, given how deep Villa tend to defend, the midfielders are often required to do a lot of the tackling to keep the opposition at arm’s length, while the defenders are there to intercept any balls that are played in behind the midfield. Jores Okore’s 2.83 interceptions per 90 is currently the highest of any Villa player and, despite only playing six matches thus far, there are only three players that have made more interceptions in total. He has been excellent at reading the game and stepping up to block passes and win the ball back. His 2.00 tackles per 90 is also the highest of any of the central defenders showing how good he has been since he was thrown in due to injuries to Vlaar, Senderos and Baker. Going forward, it is clear that the system this season is working relatively well in terms of limiting high-quality chances for the opposition, but that creating chances, and more importantly, converting those chances has been an issue. This season, Christian Benteke will be integral to this and, as he gets closer to full sharpness, this may well improve. 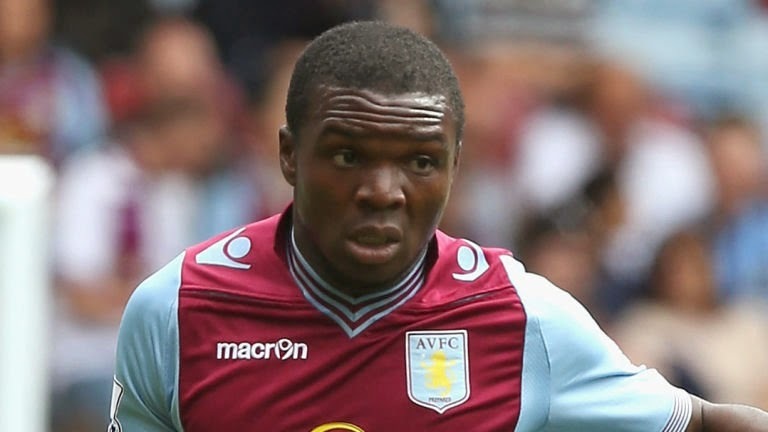 In defence, Jores Okore is rapidly becoming Villa’s classiest defender and hanging onto him for as long as possible should be one of the top priorities in the coming years. His emergence should mean that the club can cope with the loss of Ron Vlaar in the summer, as Philippe Senderos and Nathan Baker are decent back-up players to the partnership of Clark and Okore, which has really blossomed in recent weeks. If Joe Cole can stay fit, he could play a major role in creating chances for Benteke, but there is still a clear need for a creative midfielder to complement the solid foundation that Sanchez, Cleverley and Westwood can provide. Fabian Delph provides something different from those three, although it seems ever more likely that he will be departing the club at the end of the season. The coming summer should be an interesting one for Aston Villa. With the reasonable likelihood that Christan Benteke, Ron Vlaar and Fabian Delph could all be departing, there will be considerable onus on Paul Lambert to use the available funds effectively. Thus far, he has rarely been given funds to spend, but when he has spent slightly more on players, it has been relatively successful. Christian Benteke has been an outstanding signing, while Carlos Sanchez and Jores Okore are looking to be very decent players. Aly Cissokho looks to be a solid defender for the price, while Libor Kozak was showing promising signs before his injury problems. How any proceeds from the sale of Christian Benteke, plus any additional funds that may be made available now the club is in a more secure financial state, are spent this coming summer could shape the future of Aston Villa. Assuming Villa stay up this season, it has the potential to be a pivotal summer.